Solid brass traditional wall lamp in antique brass finished. ALL OUTDOOR WALL LAMP DOES NOT INCLUDE BULB. 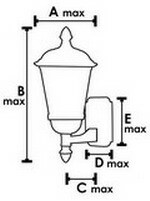 A=8", B=15 ", C=7 1/2", D=4 7/8" x E=2"
1 x Medium Base 100w Light Bulb.